Easy Crab Rangoon Dip Recipe with Baked Wonton Chips! Crab rangoons are my spirit food. 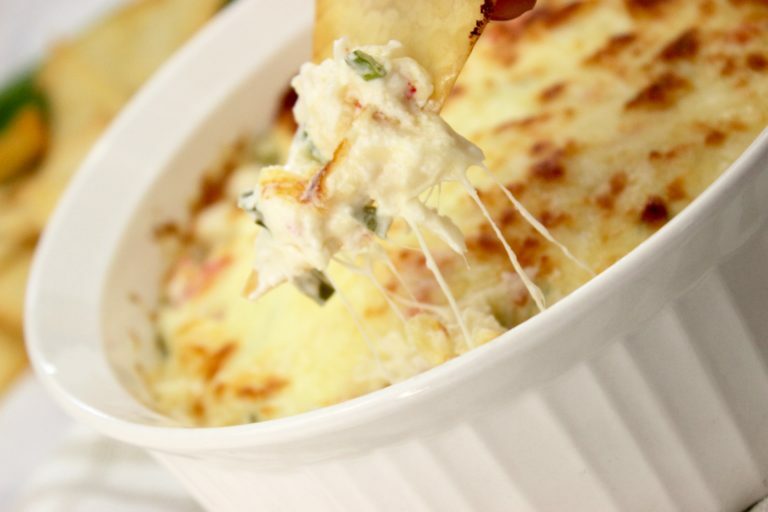 I like all of the filling oh so much that this crab rangoon dip recipe has become a go to when I know that I need a crab rangoon fix and don’t want to give in to fried crab rangoon cravings. The wonton chips that I serve with this dip are equally as delicious, too! You’ll be craving this appetizer recipe too, after you try it for the first time. Bring on all of the crab! 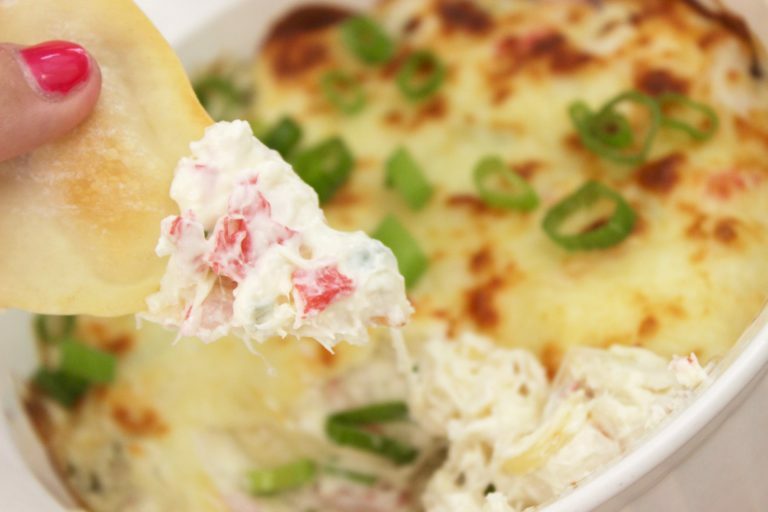 Crab is high in protein and low in fat, making it the perfect ingredient to mold your hot crab dip around. It’s a filling seafood option, and delicious all at the same time. And, I’m not going to lie, I’ve always been a huge fan of all things crab. Our local grocery store has a cold crab dip in the deli that is so delicious – I generally eat it piled on top of Ritz crackers. But this is a different hot appetizer dip, using all of the ingredients of the perfect crab rangoon, mixed together first in a large mixing bowl and then scooped into a baking dish and baked until bubbly and golden on top. Then, I scoop in my delicately baked wonton crisps making for an incredible hot appetizer dip. Check this dip out if you’re looking for a great warm dip that will satisfy all kinds of tastebuds! 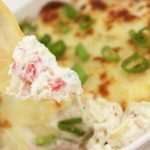 Can this crab dip recipe be made into a crab rangoon crock pot dip? You can definitely make this crab rangoon filling dip in the crockpot. Combine all of your ingredients, set the crock pot on low and be sure to keep an eye every 30-45 minutes or so to avoid burning. Could this hot crab dip be served as a cold crab dip? Of course! Although, I recommend heating up the crab dip (for example if you’re having it as leftovers) as it gets pretty hard to dip into, just because it’s got a lot of creamier and more solid ingredients. Can I make this into crab stuffed mushrooms? This dip makes incredible stuffed mushroom filling. And, if you’re eating Keto, or low carb, this is an awesome appetizer, lunch or dinner option! I have eaten this dip as crab stuffed mushrooms several times! How could I make this a spicy crab rangoon dip? This would be delicious with some chipotle seasoning, or chopped jalapeños! Could I use this dip as a crab rangoon filling? You sure could put this crab filling into wontons to make friend crab rangoons! But, to be honest I prefer it as a dip. How do I serve this easy dip with fried wonton chips? Instead of baking the wonton chips, fry them in oil in a pan or deep fat fryer! Easy peasy! 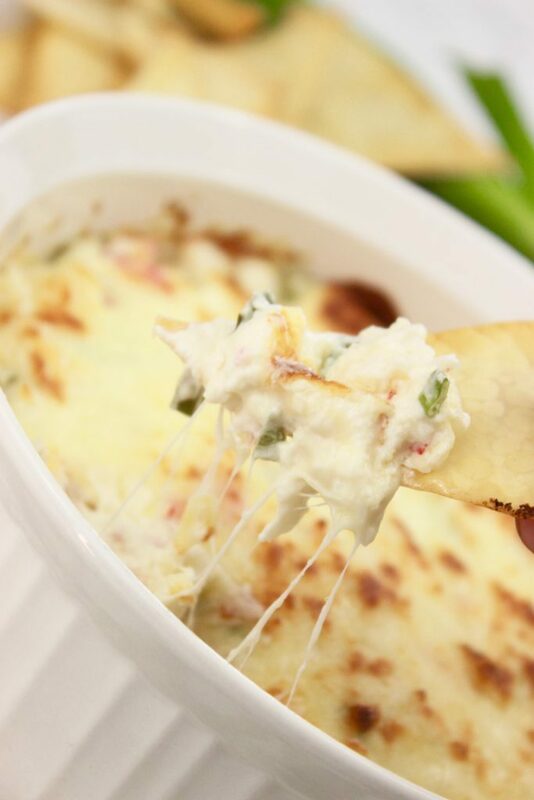 My crab rangoon dip recipe is one of my favorite hot appetizers to make! While the wonton chips/crackers are baking, combine the ingredients for the dip. Mix all ingredients, except for one half cup of mozzarella cheese. Once all of the ingredients are mixed well, put them into a 1 1/2 quart or 2 quart dish (something like these!) and top with cheese. Another way to bake the wonton wrappers is to place a wonton wrapper in each pocket of a muffin tin and spray with butter cooking spray and bake at 350 degrees for 8-12 minutes or until browned. Start with a stack of 10 or so wonton wrappers and cut them in half diagonally. Lay parchment paper on a cookie sheet, lay the wonton wrapper halves all over the baking sheet, spray with butter cooking spray. Bake another ten wrappers (20 halves) until you have as many as you'd like.